"And ever fair the vale of Nimbar, woodlands deep and glades wide, rivers sparkling in the Spring with a music soft and peaceful like unto an awakening, a sweet embrace from a warm sun slumbering deep and restful"
Having previously built a custom adventure for Castle Ravenloft and, after playing through both Drizzt and Ashardalon, I decided to try my hand at creating a custom campaign with a story line tying all three games together. There are 10 separate adventures in the 'Ruin of Nimbar' campaign which will utilise many of the mechanics from all of the individual games and (hopefully) create a more 'grandiose' sense of epicness and battle to the game. While I am still busy ironing out a few plot points, the first 2 adventures are ready to play and I will be presenting a new custom Adventure every month (or two depending) and perhaps even a play-through video. I wanted a campaign that created that feeling of an epic adventure within a larger storyline. 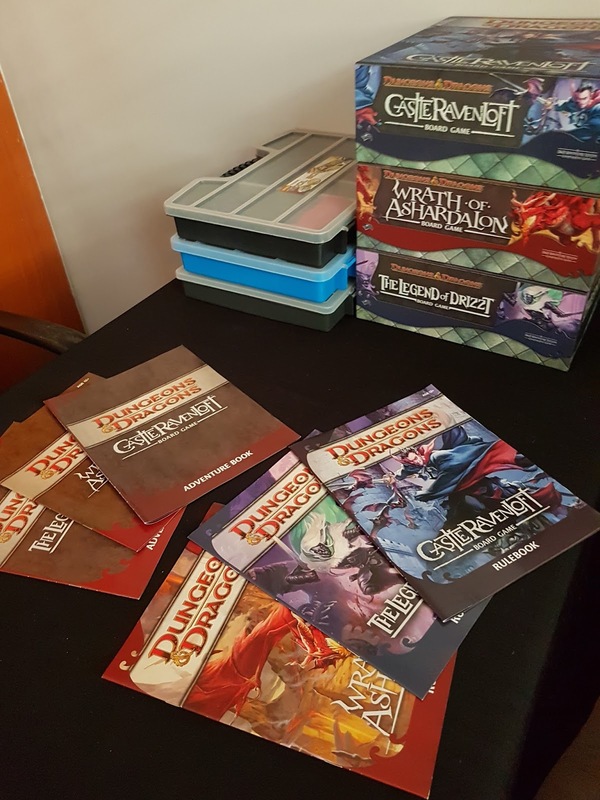 Each of the adventures are thus longer that the average D&D boardgame adventures and make use of many of the components across all three games. For the first adventure below, I wanted a solo playthrough that allowed for multiple characters. So, while it starts off with a lone Rogue looting through an 'abandoned' dungeon, you start to unlock more heroes as the story progresses. You could opt for multiplayer co-op at this point but I really wanted a strong solo experience with multiple heroes. So, after rescuing Heskan, if you choose to keep Kat in your party, you could be playing up to 4 Heroes 'double-handed'. If this bothers you stop playing or find some friends. Else..explore on young Adventurer! "Many legends ago a prophecy foretold of the coming of a great cataclysm unto the land of Nimbar and of a darkness from the North that would besiege the peaceful vale and lay ruin to its cities and towns. As such the Mages of the Everlast set upon the valley a protective shield, impenetrable and unseen, keeping the darkness at bay and fending off all manner of fell beast and dark creatures from their lands. They called this the Shimmer. The Mages then elected men and women from amongst the bravest of Nimbar and set upon them the task of Wardens, ever watchful of the foreboding shadow from the North. For 37 years the Wardens held to their stations and the vale, protected by the magics of the mages, knew only peace and contentment. But now, beyond the furthest mountains a great evil stirs and the everlasting Shimmer has begun to fade..."
Goal 1: (As Kat, the human rogue): Explore the dungeon, reach the locked vault and rescue Heskan. Goal 2: (As Heskan, the dragon-born wizard): Find and rescue Arjan and Quinn. 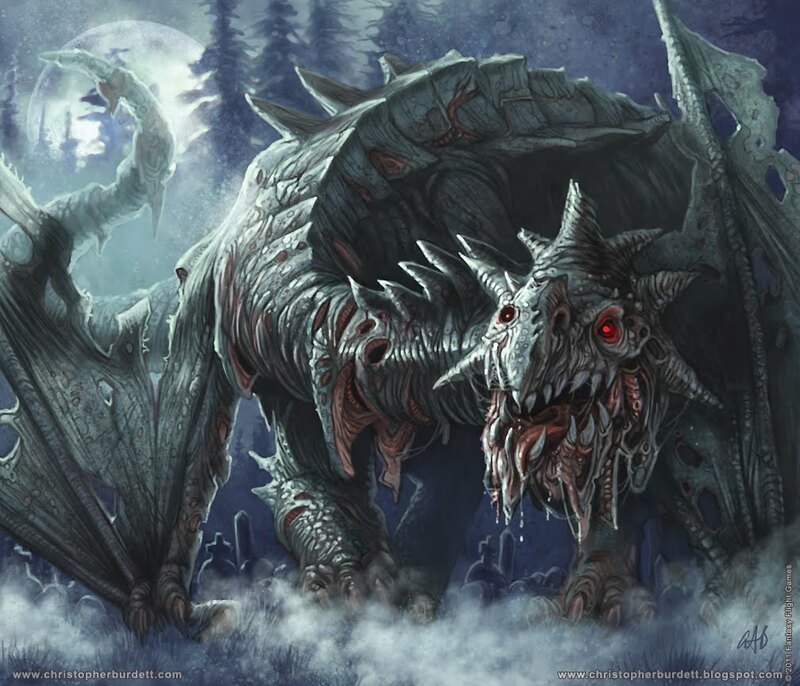 Goal 3: (As Arjan and Quinn) Defeat Klak, the Kobold Sorceror before he manages to escape the dungeon! 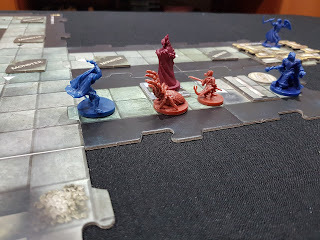 Dungeon Tiles: 17 non-named tiles from Castle Ravenloft, 5 additional random tiles from Castle Ravenloft, Secret Stairway Tile, Arcane Circle and Workshop Dungeon Tiles, Vault tile from Wrath of Ashardalon. 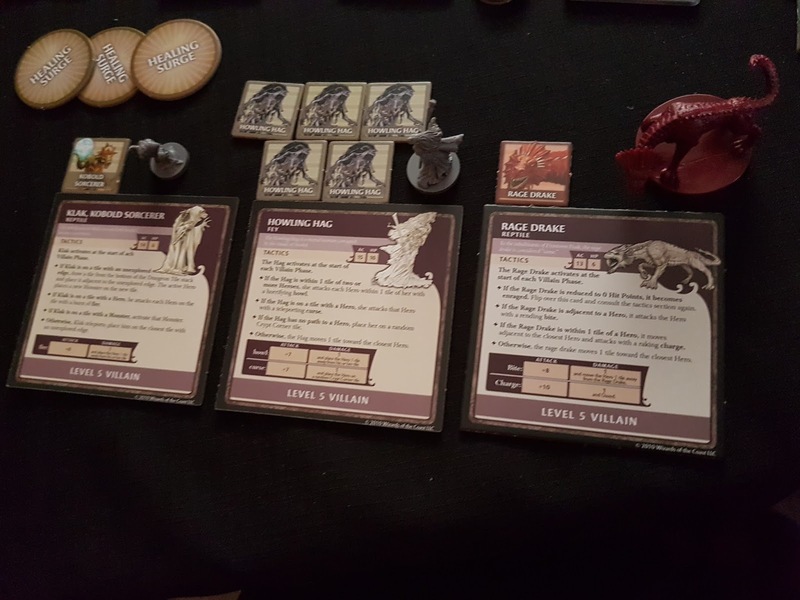 Heskan Dragon-born Wizard figurine, character card and power cards. Arjan Dragon-born Fighter figurine, character card and power cards. Quinn Human Cleric figurine, character card and power cards. 8 time tokens, lever token. Place a Start Tile on the table. Place Kat on any square of the Start Tile. 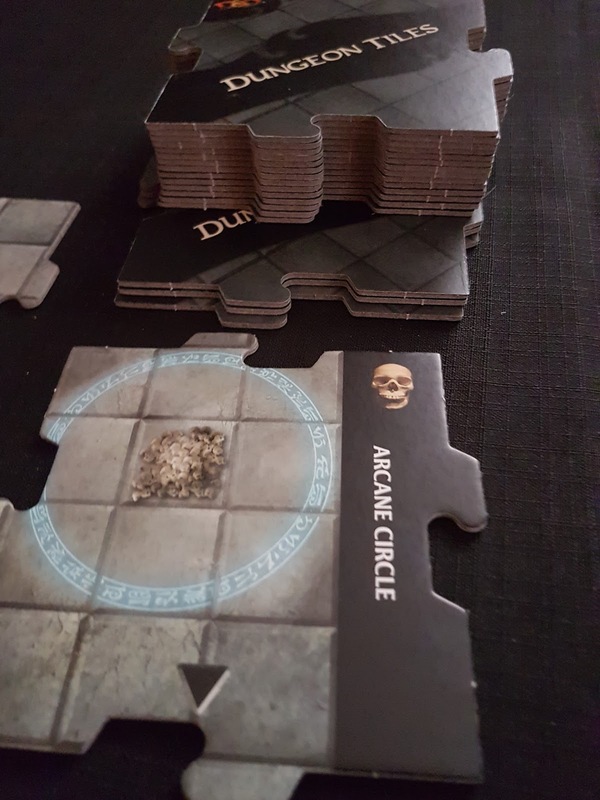 Select 3 tiles from the bottom of 17 tile dungeon stack and shuffle the Arcane Circle tile into these tiles. Then, without looking at any of the tiles, put the shuffled 4 tiles into the stack back at the bottom of the stack. In this way, the Arcane Circle will appear between the 14th and 18th tile. Now select the top 3 tiles from the stack and shuffle in the Workshop tile into these tiles. Put the shuffled 4 tiles into the stack after the 7th tile. In this way the Workshop will appear between the 8th and 12th tile. Now, again, select the top 3 tiles from the stack and shuffle in the Vault tile. Place the shuffled 4 tiles into the stack after the 3rd tile. In this way the Vault will appear between the 4th and 8th tile. The stack is now ready. 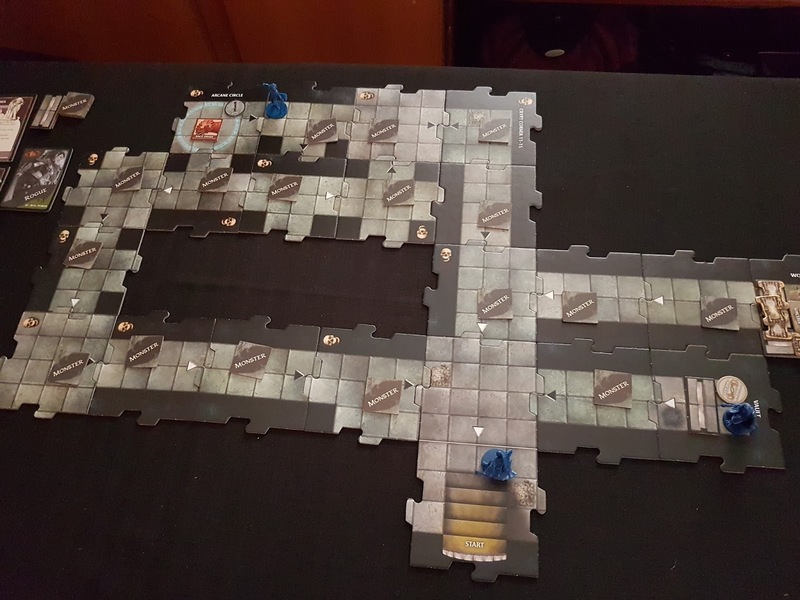 This adventure uses a pre-built dungeon complex. To create it, follow the instructions for pre-built dungeons below. 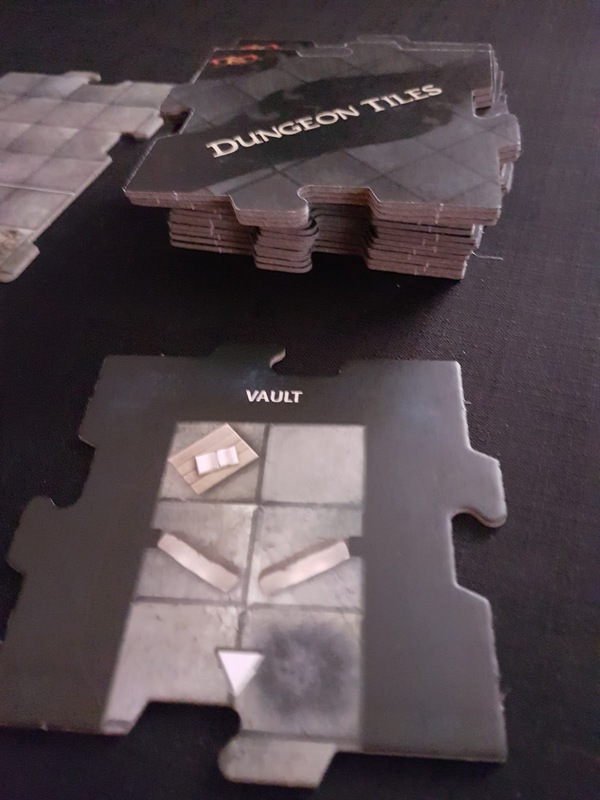 Vault Tile: When setting up the pre-built dungeon complex and the Vault tile is added, place a door marker over the entrance and place the Heskan figurine inside the vault, along with the dimensional shackles token. 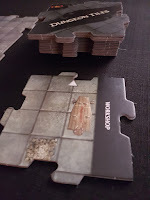 Workshop Tile: When setting up the pre-built dungeon complex and the Workshop tile is added, place door markers over the each unexplored edge of the Workshop tile and place the Quinn figurine inside the Workshop, along with the Kobold Sorceror Villain token (see photo alongside). Place the time tokens on/ around each door token. For the purpose of this adventure, these doors remain 'locked' and cannot be unlocked by any abilities apart from the lever. Arcane Circle Tile: When setting up the pre-built dungeon complex and the Arcane Circle tile is added, place the Rage Drake token and the lever token inside the Arcane Circle. Then, place the Arjan figurine on any tile adjacent to any unexplored edge of the Arcane Circle. 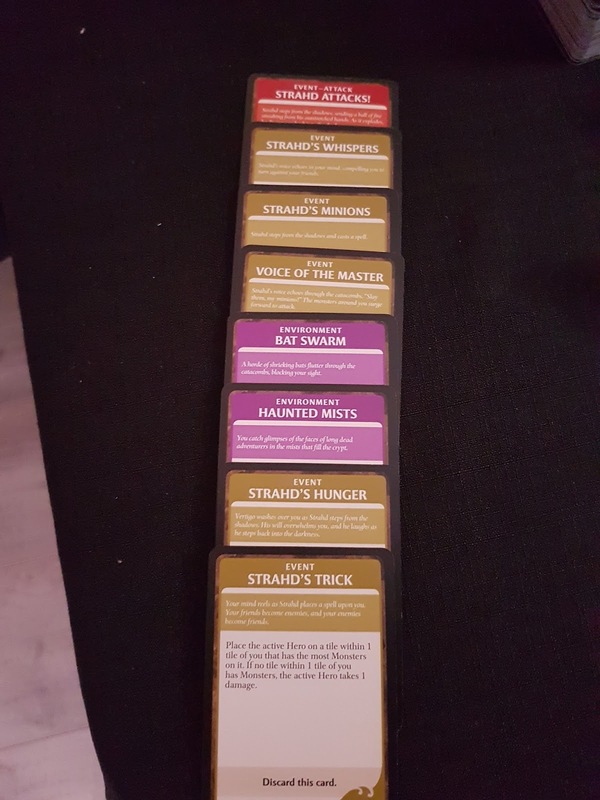 Monster Tokens: Shuffle all tokens including the 5 Howling Hag tokens and place a monster token face down on each unexplored tile except for the start tile, Vault tile, Workshop and Arcane Circle. When exploring a new tile, the monster token is flipped up and the number of indicated monsters are placed on that tile. In the case of 'no monsters', no monsters are placed. Encounters: When exploring a tile with a black arrow, an encounter card is drawn as per normal. Ignore and discard any encounter card that involves drawing and adding a dungeon tile and, instead, draw a new card. 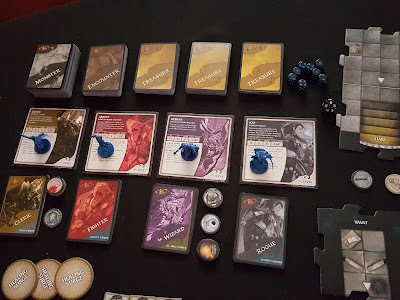 Encounters are drawn whenever a hero does not 'explore' a tile (by flipping over a monster token) or a hero did not perform an attack that turn. Howling Hag: When the Howling Hag token is flipped up, replace the token with her figurine and follow the tactics as per her card but ignore the teleportation step. The Hag may only teleport when another Hag token is revealed. In this case, she immediately teleports to the new location. If the Hag is defeated all other Hag tokens you encounter afterwards counts as 1 Monster instead. The Hag's curse attack does not teleport a hero. Instead, follow the same rules as for her howl. After every 4th Hero phase (use a D4 or counters to keep track), flip over a time token on the vault. If all of the time tokens are exhausted, you are defeated and have lost the Adventure. 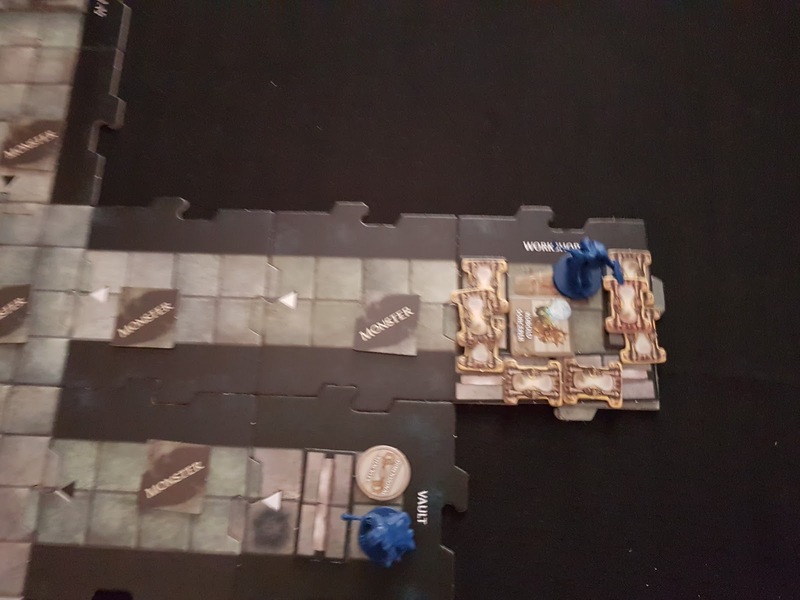 Victory: The Heroes win this adventure by 'unlocking; the Workshop, rescuing Quinn in time and defeating the Kobold Sorceror before Klak is able to escape the dungeon. Defeat: If the heroes fail to rescue Quinn in time, Klak's torturous devices proves too powerful and the Cleric is driven insane, forever haunting the labyrinthine dungeons! 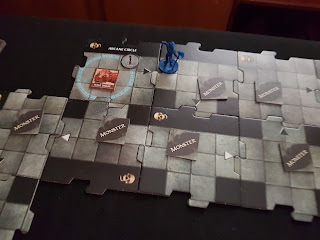 The heroes also lose the game if Klak manages to escape the dungeon by landing on the Secret Stairway tile or if any one hero is killed and no more healing surges remain. Certain that behind this door lay treasure and loot, Kat is startled to see a reptilian humanoid inside the Vault. "I am Heskan, a Wizard amongst the Dragon born and I have been hiding in here after being separated from my companions. There is some infernal evil in play inside these dungeons and I would be glad of your assistance in locating and rescuing my friends. Quinn, the Cleric and Warden of the North was taken captive by Klak, a Sorceror skilled in the arcane arts. He plans on breaking Quinn's mind in the hope of locating an ancient gem that is said to be tied to the Shimmer. We must not let him succeed! If he does, I fear a greater doom will befall these lands than the few terrors that lie within these walls. He has Quinn sealed within his vile Workshop. I overheard a band of Orcs talking about a lever that will bring down the guarded Workshop doors. Unfortunately it is guarded by a Rage Drake deep within the dungeon. Alas, my brother Arjan went in search of the lever but he has not returned. I fear the worst has befallen him. Will you join me in searching for Arjan and the lever?" Tactics: After unlocking the Vault, time tokens get flipped after every 3rd Hero phase. Quinn is running out of time! Note: Heskan's door-opening ability has no effect. Instead, Heskan may explore a tile one tile away from him. If he does, flip over the monster token on the tile. "It would be wise of we split up. I will go in search of the lever and hopefully find my brother Arjan as well while you try and locate the sealed Workshop. Quinn will need all the help he can find once I bring those doors down. Take these Dimensional Shackles along with you. There is a mad teleporting Hag on the prowl and I daresay these will come in handy." You will now play the remainder of this adventure solo 'two-handed'. Kat gains +2 hit points, 1 treasure card and activates after Heskan and the normal mode of play resumes. "Blast! This dratted Drake refuses to move from its spot. Quickly Brother, cast a diversion to distract this brute so we may get to the lever and rescue our Cleric friend!" Place Heskan on the Arcane Circle and flip over a treasure card (or a daily or utility power) from Heskan's inventory. The sound of gold coins has distracted the Drake! Move the Drake 2 tiles away from the Arcane Circle in any direction. Then, flip over the lever. (If there are no treasure or power cards to flip over Heskan will need to slay the Drake in order to access the lever). Using the dimensional magic from the Arcane Circle Heskan creates a portal that will allow a single Hero to teleport right outside the Workshop entrance. "Quickly, Arjan, step into the portal! Quinn will have need of your axe in besting that nefarious sorcerer." Things got messy fast - a 3 Monster flip-over! "Curses! This vile sorcery has taken its toll on me! I fear that should Klak escape, he will pass on what little he could learn from his vile tinkering of my mind. We should stop him, lest he passes on further knowledge of the Shimmer and the Everlast to his dark masters!" Place the 5 additional dungeon tiles in a stack next to the Workshop. Then place the secret stairway at the bottom of the stack. At the end of the villain phase, draw a tile from the top of the stack and add it to any adjacent edge of the workshop tile or a tile connected to the workshop with an unexplored edge. Then place Klak on this tile. At the start of the next Hero phase, you take control of Quinn and try to defeat Klak, the Kobold Sorceror before he escapes. Place Arjan just on any tile adjacent to the Workshop tile. Arjan activates immediately after Quinn. If Klak is destroyed the heroes win the game. Note: If you chose to keep Kat and she made it to the Workshop in time, you may play Kat after Arjan and she may assist the Heroes in defeating Klak. 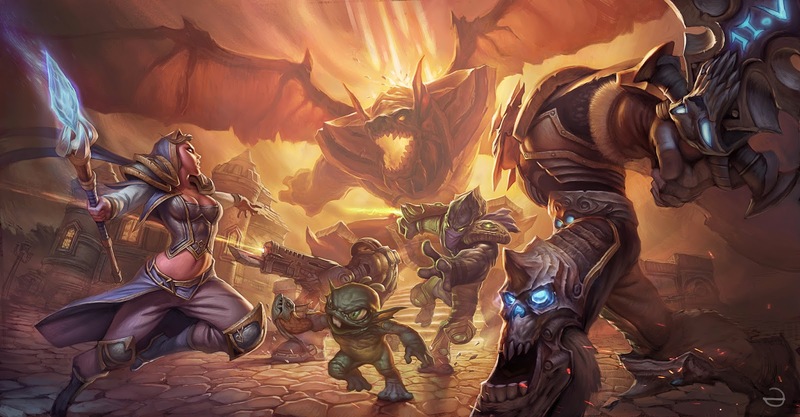 If Klak reaches the Secret Stairway tile, the heroes lose the game. Klak has escaped! Bonus: Heskan may go on to attempt to defeat the Rage Drake. If he does, he gains 2 additional treasure cards. Start tile as indicated by the adventure. Cavern Edge Tiles (when indicated). Place the start tile on the table. Add one new dungeon tile next to each unexplored edge of the start tile. Then place one new tile next to each unexplored edge of the tiles you previously placed. Continue to add dungeons tiles to unexplored tile edges. 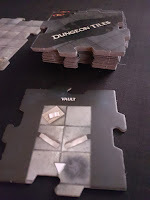 In most of the Ruin Of Nimbar adventures you would have a total of 20 dungeon tiles (excluding the start tile) laid out. If you encounter long hallway tiles, immediately place a new tile adjacent to its unexplored edge if possible. If you encounter tiles with doors, shuffle and add a door marker. Tiles with door edges count as unexplored edges. You may place tiles on the 'other' side of the doors. 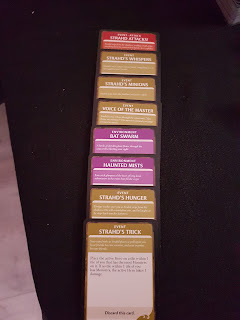 If you encounter named tiles, place them according to the adventure. For example, Adventure 1: The Dungeons of Nerath uses a pre-built 20 tiled dungeon with the Vault, Arcane Circle and Workshop named tiles. These are shuffled in to the dungeon tile after the 3rd, 8th and 14th tile and are laid out in the same manner as a normal dungeon tile. 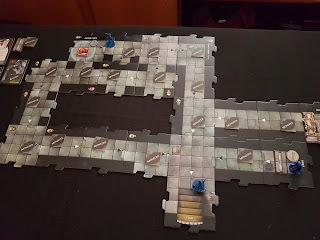 If the adventure calls for a pre-built chamber complex, all the chamber tiles (Horrid Chamber, Dire Chamber or Ravenloft crypts) get built into the dungeon. Chambers may only be entered by a single entrance and exit, unless indicated otherwise. Do not place normal dungeons tiles around chamber tiles, apart from the chamber entrance tiles.